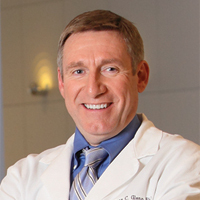 Dr. Glenn’s research interests have focused on the relationships between cerebral blood flow, cerebral vascular function, and metabolism. He has investigated the influence of trauma and subarachnoid hemorrhage on these cerebral parameters. Much of this research has been conducted in the critical care environment on patients with acute types of brain injury. Soustiel JF , Glenn TC , Shik V , Boscardin J , Mahamid E , Zaaroor M . Monitoring of cerebral blood flow and metabolism in traumatic brain injury. J Neurotrauma. 2005 Sep;22(9):955-65. Vespa P, Boonyaputthikul R, McArthur DL, Miller C, Etchepare M, Bergsneider M, Glenn T, Martin N, Hovda D. Intensive insulin therapy reduces microdialysis glucose values without altering glucose utilization or improving the lactate/pyruvate ratio after traumatic brain injury. Crit Care Med, 2006, 34(3), 850-6. Hu X, Nenov V, Glenn TC, Steiner LA, Czosnyka M, Bergsneider M, Martin N. Nonlinear analysis of cerebral hemodynamic and intracranial pressure signals for characterization of autoregulation. IEEE Trans Biomed Eng 2006, 53(2), 195-209. Hu X, Nenov V, Bergsneider M, Glenn TC, Vespa P. Martin N. Estimation of hidden state variables of the Intracranial system using constrained nonlinear Kalman filters. IEEE Trans Biomed Eng. 2007 Apr;54(4):597-610. Vespa PM, Miller C, McArthur D, Eliseo M, Etchepare M, Hirt D, Glenn TC, Martin N, Hovda D Nonconvulsive electrographic seizures after traumatic brain injury result in a delayed, prolonged increase in intracranial pressure and metabolic crisis. Crit Care Med. 2007 Dec; 35( 12): 2830-6. Gonzalez NR, Boscardin WJ, Glenn TC, Vinuela F, Martin N. Vasospasm probability index: a combination of transcranial doppler velocities, cerebral blood flow, and clinical risk factors to predict cerebral vasospasm after aneurysmal subarachnoid hemorrhage. J Neurosurg. 2007 Dec; 107( 6): 1101-12. Marcoux J, McArthur DA, Miller C, Glenn TC, Villablanca P, Martin NA, Hovda DA, Alger JR, Vespa PM. Persistent metabolic crisis as measured by elevated cerebral microdialysis lactate-pyruvate ratio predicts chronic frontal lobe brain atrophy after traumatic brain injury. Crit Care Med. 2008 Oct;36(10):2871-7.